Petiteksf: Bouquet from Floral Garage! I love coming home to a beautiful bouquet on my desk. I mean.. which girl doesn't? Floral Garage has definitely brightened up my week with a lovely bouquet made with my favorite baby breath and blue roses! I chanced upon their website and they offer a wide variety of bouquets and hampers. 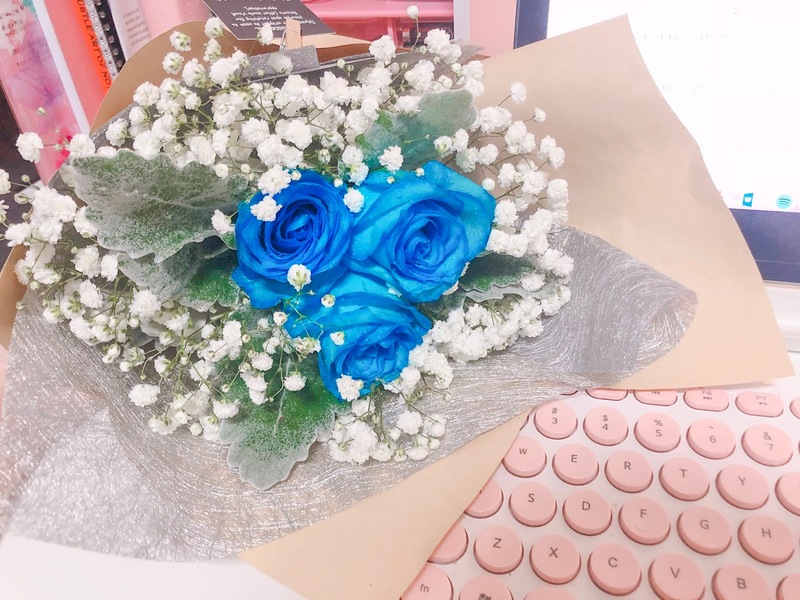 Chesna recommended me to pick their (best-seller) freestyle bouquet which I will be able to choose my favorite flowers and the style in which I want my bouquet wrapped. 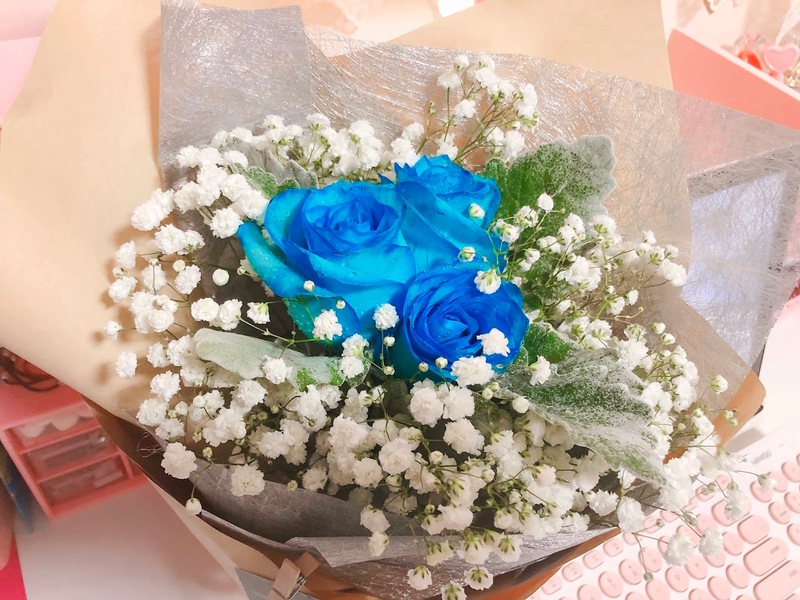 Since I was given a chance to, I decided to keep it simple with just blue roses and baby breath. Seriously, they're so so so pretty in real life! 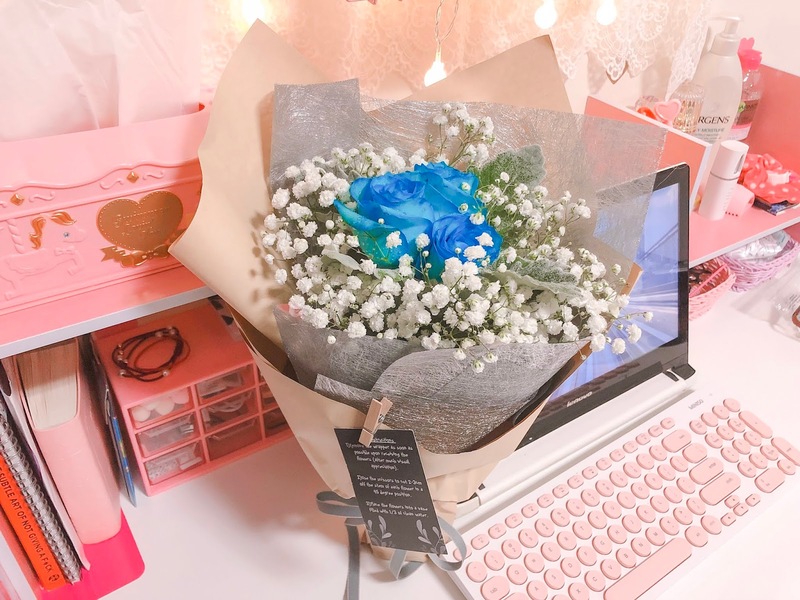 The blue roses and baby breath are such a mood lifter after a long day of work. The bouquet was delivered the same day I sent my second request, the roses were still fresh and it bloomed beautifully! How I wish they will never wither!!! :( They also gave a small card with instructions on how I can take care of the bouquet keeping them alive for a longer period of time just so I can appreciate how beautiful they are really are, hehe. The Floral Garage also has a subscription plan, which is very ideal for someone who is very forgetful with their anniversary dates (like me) HAHAHA or just too busy with work and it slips your mind. They'll accommodate your request and surprise your loved ones! Apart from their wide selections of bouquets, hampers and subscription plan, they also give back to the society! Some of their profits go into raising funds for animals shelter and children in need. Thank you Floral Garage for this lovely bouquet and having to accommodate to my weird request. If you're running out of idea for gifts, you can consider getting flowers from them!